Home > Resources > Transfer > How to Transfer Contacts from iPhone to Nexus 6? Intending to switch to Android platform because you just be bored with your old iPhone which you have used for several years. To choose an Android smartphone, the new Google Nexus 6 is a good choice. And after you purchase the Nexus 6, you must can't wait to transfer all contacts from your old iPhone to the new phone so that you can share the good news with your friends in first time. However, transferring contacts may be troublesome for you since editing contacts one by one manually will take you a long time. Don't bother yourself! 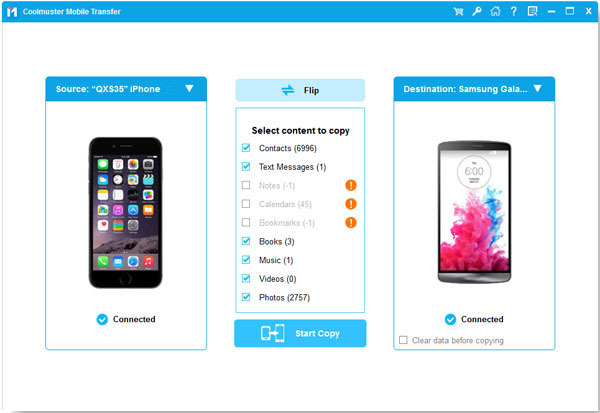 Now, with Coolmuster Mobile Transfer, a professional iPhone to Nexus 6 data transfer program empowers you with the ability to copy iPhone X/8/8 Plus/7/7 Plus/6S/6S Plus/6/6 Plus/5S/5 contacts to Google Nexus 6/5/4 quickly with just one click. In addition to contacts, Mobile Transfer also allows you to transfer photos, videos, music and more between any iOS and Android devices. All what you need are iPhone and Nexus 6, two USB cables, a computer and this Coolmuster Mobile Transfer. Download the free trial version of this iPhone to Nexus 6 contacts transfer tool on your computer. Then, begin the contacts transfer by following the steps below tell you to do. 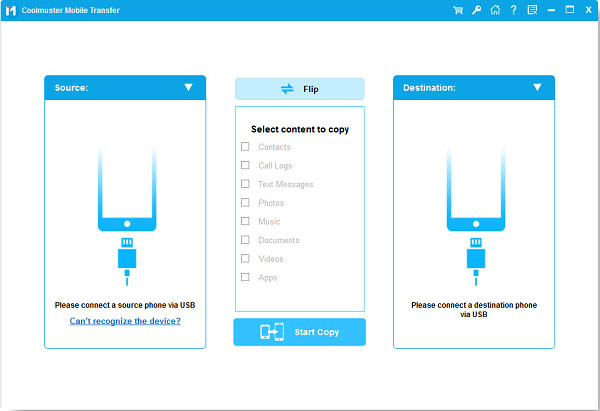 To get started, install the downloaded Mobile Transfer and launch it on your computer. Then, you will see the primary window is displayed like below picture. Next, use two USB cables to link your old iPhone and new Nexus 6 with computer. The iPhone to Nexus 6 contacts transfer tool will discover them once the connection is successful. Tick off the data that you want to transfer from iPhone to Nexus 6. Here, you should only choose "Contacts" and click the "Start Copy" button in the middle to begin the contacts transfer process. Be sure the two devices are connecting with your computer until the transferring is finished.